Redirecting to: www.famous-trials.com/trianglefire in (10) seconds. It was a warm spring Saturday in New York City, March 25, 1911. On the top three floors of the ten-story Asch Building just off of Washington Square, employees of the Triangle Shirtwaist Factory began putting away their work as the 4:45 p.m. quitting time approached. Most of the several hundred Triangle Shirtwaist employees were teenage girls. Most were recent immigrants. Many spoke only a little English. Just then somebody on the eighth floor shouted, "Fire!" Flames leapt from discarded rags between the first and second rows of cutting tables in the hundred-foot-by-hundred-foot floor. Triangle employee William Bernstein grabbed pails of water and vainly attempted to put the fire out. As a line of hanging patterns began to burn, cries of "fire" erupted from all over the floor. In the thickening smoke, as several men continued to fling water at the fire, the fire spread everywhere--to the tables, the wooden floor trim, the partitions, the ceiling. A shipping clerk dragged a hose in the stairwell into the rapidly heating room, but nothing came--no pressure. Terrified and screaming, girls streamed down the narrow fire escape and Washington Place stairway or jammed into the single passenger elevator. Dinah Lifschitz, at her eighth-floor post, telephoned the tenth floor headquarters of the Triangle Shirtwaist Factory: "I heard Mary Alter's voice on the other end. I told her there was a fire on the eighth floor, to tell Mr. Blanck." Lifschitz tried next to alert the workers on the ninth floor. She got no answer. "I can't get anyone! I can't get anyone! ", she yelled. On the eighth floor, only Lifschitz and Samuel Bernstein remained in the gathering smoke and flames. Bernstein told Lifschitz to escape, while he attempted a daring dash through the blaze into the Greene Street staircase. He ran up to the ninth floor, but found the fire so intense he could not enter. He continued up to the tenth floor where he found panicked employees "running around like wildcats." Some employees had fled through the elevator, but now that it had stopped running the only escape route was to the roof on top of the Asch building. Assistant cashier Joseph Flecher looked down from the tenth floor roof to see "my girls, my pretty ones, going down through the air. They hit the sidewalk spread out and still." Fifteen feet above the Asch building roof, Professor Frank Sommer was teaching his class at the New York University Law School when he saw dozens of hysterical Shirtwaist workers stumbling around on the roof below. Sommer and his students found ladders left by painters and placed them so as to allow the escaping employees to climb to the school roof. The last tenth-floor worker saved was an unconscious girl with smoldering hair who was dragged up the ladder. Of the approximately seventy workers on the tenth floor, all but one survived. In the hell of the ninth-floor, 145 employees, mostly young women, would die. Those that acted quickly made it through the Greene Street stairs, climbed down a rickety fire escape before it collapsed, or squeezed into the small Washington Place elevators before they stopped running. The last person on the last elevator to leave the ninth floor was Katie Weiner, who grabbed a cable that ran through the elevator and swung in, landing on the heads of other girls. A few other girls survived by jumping into the elevator shaft, and landing on the roof of the elevator compartment as it made its final descent. The weight of the girls caused the car to sink to the bottom of the shaft, leaving it immobile. For those left on the ninth floor, forced to choose between an advancing inferno and jumping to the sidewalks below, many would jump. Others, according to survivor Ethel Monick, became "frozen with fear" and "never moved." It took only eighteen minutes to bring the fire under control, and in ten minutes more it was practically "all over." Water soaked a pile of thirty or more bodies on the Greene Street sidewalk. Doctors pawed through heaps of humanity looking for signs of life. Police tried desperately to keep crowds of hysterical relatives from overrunning the disaster scene. Officers filled coffins and loaded them into patrol wagons and ambulances. The bodies were taken to a temporary morgue set up on a covered pier at the foot of East Twenty-sixth Street. Firemen searched the burned-out floors of the Asch building, hoping to find survivors. What they mostly found were, according to Chief Edward Croker, "bodies burned to bare bones, skeletons bending over sewing machines." Four hours after the fire, workers discovered a lone survivor trapped in rising water at the bottom of the elevator shaft. Within two days after the fire, city officials began announcing preliminary conclusions concerning the tragic fire. Fire Marshal William Beers stated that the fire probably began when a lighted match was thrown into either waste near oil cans or into clippings under cutting table No. 2 on the Greene Street side of the eighth floor. Despite an announced policy of no smoking in the factory, Beers reported that fire investigators picked up many cigarette cases near the spot of the fires origin, and that many employees reported that smoking on the premises was commonplace. Fire Chief Edward Croker told the press that doors leading into the factory workplace appeared to be locked and that his men had to chop their way through doors to get at the fire. Many pointed fingers at New York City's Building Department, blaming it for an inadequate inspection of the Triangle Shirtwaist factory. District Attorney Charles Whitman called for "an immediate and rigid" investigation to determine whether the Building Department "had complied with the law." Coroner Holtzhauser, sobbing after his inspection of the Asch Building, declared: "Only one little fire escape! I shall proceed against the Building Department along with the others. They are as guilty as any." Defending the Department against charges he called "outrageously unfair," Borough President George McAneny said the building met standards when plans were filed for it eleven years earlier, and that the Department was seriously understaffed and underfunded and rarely had time to look at buildings except those being constructed. Calls for justice continued to grow. Rev. Charles Slattery, rector of a church a few blocks from the fire scene, told his congregation that "It will perhaps be discovered that someone was too eager to make money out of human energy to provide the proper safeguards." At an emotional protest meeting on Twenty-Second Street four days after the fire, relatives of the dead broke into hysterical cries of despair. People began fainting, and over fifty persons were treated. The editor of a socialist paper told the crowd that "These deaths resulted because capital begrudged the price of another fire escape." At Cooper Union, a banner stretching across the platform said: "Locked doors, overcrowding, inadequate fire escapes....We demand for all women the right to protect themselves." Fire Chief Croker issued a statement urging "girls employed in lofts and factories to refuse to work when they find [potential escape] doors locked." Much of the public outrage fell on Triangle Shirtwaist owners Isaac Harris and Max Blanck. Harris and Blanck were called "the shirtwaist kings," operating the largest firm in the business. They sold their medium-quality popular garment to wholesalers for about $18 a dozen. They ran their factory by hiring machine operators and allocating to each about six sewing machines from among the 240 machines on the ninth floor. The operators hired young girls and women, usually immigrants, who they would then instruct in the art of shirtwaist-making. The girls earned whatever the machine operator chose to pay them. Overworked and underpaid, garment workers struck Triangle in the fall of 1909. Management responded by hiring prostitutes to "strike women" and thugs and plainclothes detectives "to hustle them off to court on flimsy pretexts," according to an article in Survey magazine. 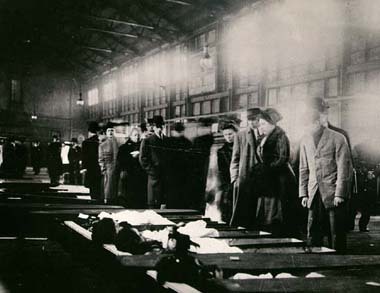 The strike soon spread to other shirtwaist manufacturers. By Christmas, 723 employees had been arrested, but the public largely sided with labor. After thirteen weeks, the strike ended with new contracts establishing a 52-hour maximum work week and wage increases of 12 to 15%. Two weeks after the fire, a grand jury indicted Triangle Shirtwaist owners Isaac Harris and Max Blanck on charges of manslaughter. The trial of Harris and Blanck began on December 4, 1911 in the courtroom of Judge Thomas Crain. Harris and Blanck were defended by a giant of the New York legal establishment, forty-one-year-old Max D. Steuer. Heading up the prosecution team was Assistant District Attorney Charles S. Bostwick. Crowds of angry relatives of victims filled the courtroom building. When Harris and Blanck exited from a courtroom elevator on the second day of the trial they were met by women shrieking, "Murderers! Murderers!" and "Give us back our children!" Extra police were called in to prevent a reoccurrence of the incident. In his opening statement, Charles Bostwick told jurors that he would prove through witnesses that the ninth floor door that might have been an escape route for victims was locked at the time of the fire. More particularly, he said he would prove that the locked door caused the death of Margaret Schwartz, one of the 146 workers killed on March 25. Bostwick produced 103 witnesses, many of them young Triangle employees dressed in their Sunday best. Through his witnesses Bostwick tried to establish that the fire quickly cut off escape through the Greene Street door, causing the panicked workers to turn to the Washington Place door--a door the prosecution contended was locked. More than a dozen prosecution witnesses testified that they tried the door and were unable to open it. Katie Weiner told jurors, "I pushed it toward myself and I couldn't open it and then I pushed it outward and it wouldn't go. I was crying, 'Girls, help me!' Other witnesses testified that Blanck and Harris kept the door locked to prevent employees from pilfering shirtwaists. (On the stand, Harris admitted to an almost obsessive concern with employee theft even though he conceded that the total value of goods taken over the years was under $25). I wanted to go up Greene street side, but the whole door was in flames, so I went in hid myself in the toilet rooms and bent my face over the sink, and then ran to the Washington side elevator, but there was a big crowd and I couldn't pass through there. I noticed someone, a whole crowd around the door, and I saw the Bernstein, the manager's brother trying to open the door, and there was Margaret near him. Bernstein tried the door, he couldn't open it and then Margaret began to open the door. I take her on one side I pushed her on the side and I said, "Wait, I will open that door." I tried, pulled the handle in and out, all ways--and I couldn't open it. She pushed me on the other side, got hold of the handle and then she tried. And then I saw her bending down on her knees, and her hair was loose, and the trail of her dress was a little far from her, and then a big smoke came and I couldn't see. I just know it was Margaret, and I said, "Margaret," and she didn't reply. I left Margaret, I turned my head on the side, and I noticed the trail of her dress and the ends of her hair begin to burn. In his cross-examination of Alterman, Max Steuer settled on an unusual approach. He asked Alterman to repeat he account of Margaret Schwartz's death again and again. Each time, the words Alterman used were very similar, but not identical. Steuer hoped that the repetition of phrases (e.g., "curtain of fire," a desperate man running around "like a wildcat") would suggest to the jury that the witness had been coached by the defense. In redirect, Bostwick asked his witness why she used similar language each time she was asked to describe Schwartz's death. Alterman replied, "Because he asked me the very same story over and over, and I tried to tell him the same thing, because he asked me the same thing over and over." Yet, to many observers, Steuer had succeeded in damaging Alterman's credibility without ever directly attacking it. The defense presented witnesses designed to show that the ninth floor deaths resulted from fire blocking the Washington Place stairwell, even though the door was actually open. Various salesmen, shipping clerks, watchmen, painters, and other building engineers told of their passage through the disputed ninth floor door--though, of course, none had attempted to exit through the door at the time of the fire. Louis Brown said a key was "all the time in the lock." Ida Mittleman said a key was attached to the door by tape "or something." Defense witness May Levantini testified that a key to the lock hung from a piece of string. Levantini was the prosecution's key witness, telling jurors that she turned the key in the door and opened it only to find "flames and smoke" that made her "turn in and run to the elevators." Bostwick contended Levantini "lied on the stand." He said numerous witnesses described going down the stairwell that Levantini said she saw in flames, and all that went down made it out untouched. After presenting 52 witnesses, the defense rested. On December 27, Judge Crain read to the jury the text of Article 6, Section 80, of New York's Labor Law: "All doors leading in or to any such factory shall be so constructed as to open outwardly where practicable, and shall not be locked, bolted, or fastened during working hours." Crain told the jury that in order to return a verdict of guilty they must first find that door was locked during the fire--and that the defendants knew or should have known it was locked. The judge also told the jury that they must find beyond a reasonable doubt that the locked door caused the death of Margaret Schwartz. After deliberating for just under two hours, the jury returned a verdict of not guilty. After the verdict, one juror, Victor Steinman declared, "I believed that the door was locked at the time of the fire, but we couldn't find them guilty unless we believed they knew the door was locked." Surrounded by five policemen, Blanck and Harris hurried through the judge's private exit to Leonard Street. Those in the crowd that saw the men yelled, "Justice! Where is justice!" The defendants ran to the nearest subway station, the crowd in pursuit. In March 1912, Bostwick attempted to prosecute Blanck and Harris again, this time for the manslaughter death of another fire victim, Jake Kline. However, Judge Samuel Seabury instructed the jury that the men were being "tried for the same offense, and under our Constitution and laws, this cannot be done." He told the jury to "find a verdict for the defendants." Three years after the fire, on March 11, 1914, twenty-three individual civil suits against the owner of the Asch Building were settled. The average recovery was $75 per life lost. Out of that terrible episode came a self-examination of stricken conscience in which the people of this state saw for the first time the individual worth and value of each of those 146 people who fell or were burned in that great fire...We all felt that we had been wrong, that something was wrong with that building which we had accepted or the tragedy never would have happened. Moved by this sense of stricken guilt, we banded ourselves together to find a way by law to prevent this kind of disaster....It was the beginning of a new and important drive to bring the humanities to the life of the brothers and sisters we all had in the working groups of these United States.